Two major issues confronting magnetic-confinement fusion energy are enabling the walls of devices that house fusion reactions to survive bombardment by energetic particles, and improving confinement of the plasma required for the reactions. 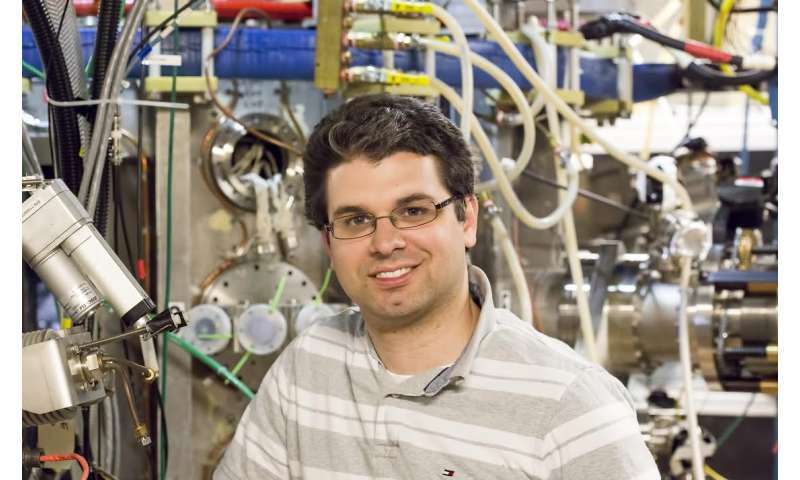 At the U.S. Department of Energy's (DOE) Princeton Plasma Physics Laboratory (PPPL), researchers have found that coating tokamak walls with lithium— a light, silvery metal— can lead to progress on both fronts. Recent experiments on the Lithium Tokamak Experiment (LTX), the first facility to fully surround plasma with liquid lithium, showed that lithium coatings can produce temperatures that stay constant all the way from the hot central core of the plasma to the normally cool outer edge. The findings confirmed predictions that high edge temperatures and constant or nearly constant temperature profiles would result from the ability of lithium to keep stray plasma particles from kicking—or recycling—cold gas from the walls of a tokamak back into the edge of the plasma. Fusion devices will operate near 100 million degrees Celsius, hotter than the 15 million-degree core of the sun. The edge of the plasma, just a few meters from the 100 million-degree core, will normally be a relatively cool few thousand degrees, like the ionized gas—or plasma—inside a fluorescent light bulb. "This is the first time that anybody has shown experimentally that the edge of the plasma can remain hot due to reduced recycling," said physicist Dennis Boyle, lead author of a paper published online July 5 in the journal Physical Review Letters. Support for this work comes from the DOE Office of Science. Could the result be that the cooler edge migrates in toward the center producing a hot core, a cooler halo ring and a hot edge?